I'm a roadie ever since dabbling and I mean dabbling in road racing back in my twenties. Track racing is another world on it's own and full of unpredictable excitement. With the world track championships over in Denmark there's one Canadian that deserves high praise. Her name is Tara Whitten from Edmonton. 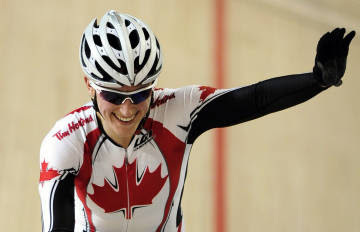 And of course, I'm waving the Maple Leaf as she has powered her way in winning two gold's in the: point race & the omnium event. 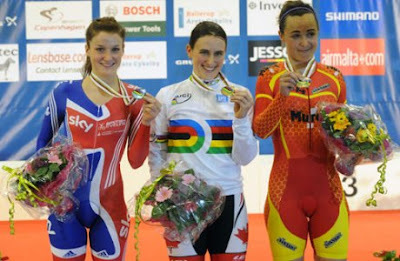 Congratulation's to her becoming world champion. Great performance! Whitten celebrates winning today's point race!